The British Army comprised 500 British and Portuguese cavalry, 20,000 infantry and 18 guns. The French Army comprised 1 cavalry division of 2,000 men, 5 infantry brigades of 12,000 men and 23 guns. The British infantry wore red waist-length jackets, white trousers, and stovepipe shakos. Fusilier regiments wore bearskin caps. The two rifle regiments wore dark green jackets. The 20th Light Dragoons wore light blue. The Royal Artillery wore blue tunics. Highland regiments wore the kilt with red tunics and black ostrich feather caps. The King’s German Legion (KGL) was the Hanoverian army in exile. The KGL owed its allegiance to King George III of Great Britain, in his position as the Elector of Hanover, and fought with the British army. The KGL comprised both cavalry and infantry regiments. As with the British, the KGL infantry wore red. The Portuguese infantry wore blue uniforms. The French army wore a variety of uniforms. The basic infantry uniform was dark blue. The French cavalry comprised Cuirassiers wearing heavy burnished metal breastplates and crested helmets, Dragoons largely in green, Hussars in the conventional uniform worn by this arm across Europe and Chasseurs à Cheval dressed as hussars. The French artillery dressed in uniforms similar to the infantry, the horse artillery in hussar uniforms. The standard infantry weapon across all the armies was the muzzle-loading musket. The musket could be fired at three or four times a minute, throwing a heavy ball inaccurately for a hundred metres or so. Each infantryman carried a bayonet for hand-to-hand fighting, which fitted the muzzle end of his musket. The British rifle battalions (60th and 95th Rifles) carried the Baker rifle, a more accurate weapon but slower to fire, and a sword bayonet. Field guns fired a ball projectile, of limited use against troops in the field unless those troops were closely formed. Guns also fired case shot or canister which fragmented and was highly effective against troops in the field over a short range. Exploding shells fired by howitzers, yet in their infancy were of particular use against buildings. The British were developing ‘shrapnel’ which increased the effectiveness of exploding shells against troops in the field, by showering them with metal fragments. Throughout the Peninsular War and the Waterloo campaign, the Duke of Wellington was plagued by a shortage of artillery. The British Army was sustained by volunteer recruitment and the Royal Artillery was never able to recruit sufficient gunners for its needs. Napoleon exploited the advances in gunnery techniques of the last years of the French Ancien Régime to create his powerful and highly mobile artillery. Many of his battles were won using a combination of the manoeuvrability and fire power of his guns with the speed of his columns of infantry, supported by the mass of his cavalry. While the French conscript infantry moved about the battle field in fast moving columns, the British trained to fight in line. The Duke of Wellington reduced the number of ranks to two to exploit fully the firepower of his regiments. 7th Brigade, Brigadier General Anstruther: 2nd/43rd Foot, 2nd/52nd Foot and 97th Foot. In August 1808 the British government of the Duke of Portland sent a British army to Portugal, to assist the Portuguese in evicting the Marshal Junot’s French army of occupation. The first British troops to reach Portugal were commanded by Lieutenant General Sir Arthur Wellesley (later the Duke of Wellington). Wellesley was considered too junior a lieutenant general to remain in command. More senior officers were to follow, Sir Harry Burrard and Sir Hew Dalrymple. A further British corps was on its way to Portugal, commanded by Sir John Moore, also senior to Wellesley. Wellesley landed his army near Coimbra in central Portugal. His intention was to march to Lisbon, but this plan was vetoed by Lieutenant General Sir Harry Burrard, who outranked Wellesley and arrived from England soon after the main army. Burrard considered the planned march on Lisbon excessively rash, until the further British troops commanded by Sir John Moore arrived. Wellesley was forced to wait for the French to attack him. Fortunately, Wellesley’s opposing French commander, Marshal Junot, bore the nickname of ‘the Hurricane’ and was hastening from Lisbon to attack the British force. Wellesley would have his battle. Junot was forced to leave in Lisbon a sufficient garrison to keep the Portuguese in thrall, causing him to march to attack the British with an army smaller than Wellesley’s, although stronger in cavalry. Junot mistakenly believed that his force was larger than the British. Wellesley’s army was based on the village of Vimeiro, on the bank of the Maceiro River. Wellesley anticipated that Junot would launch his main attack on the village itself. Fane’s and Anstruther’s British brigades were positioned to the east of Vimeiro with 12 guns. A ridge stretched away from the River Maceiro to the north. The British brigades of Wellesley’s left wing were positioned along the ridge. Hill’s brigade was south of the river. Craufurd’s brigade formed the reserve. The one cavalry regiment, the 20th Light Dragoons, was to the west of Vimeiro. The French army reached the area of Vimeiro on the morning of 21st August 1808. The French cavalry spread over the area in front of the British positions, while Junot’s infantry halted in front of the hill masking Vimeiro, where the brigades of Fane and Anstruther were positioned. Junot formed the plan of attacking the British in Vimeiro, as Wellesley expected, while simultaneously sending a force around the northern end of the ridge to cut the British from their sea transports. General Brenier’s brigade was ordered to move around the British left flank, while Junot attacked Vimeiro with his main strength. Brenier’s approach could be followed from the British side by the cloud of dust the marching troops generated, causing Wellesley to move several of his brigades along the ridge to counter the threat. Once he was satisfied that Brenier’s outflanking manoeuvre was under way, Junot launched the brigades of Thomière and Charlot against Vimeiro. These brigades were led by the divisional commanders, Delaborde and Loisin. 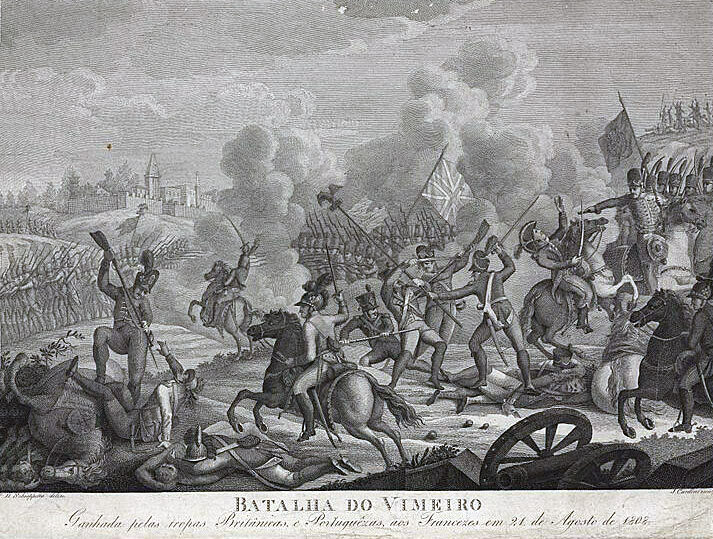 The French attack fell on the British brigades of Fane and Anstruther on Vimeiro Hill. After some confused fighting the British regiments of Fane’s brigade, 50th, 60th and 2nd/95th Regiments, drove Thomière’s brigade back down the hill, taking several guns. On the right, the regiments of Anstruther’s brigade, 97th, 43rd and 9th Regiments, subjected Charlot’s brigade to several heavy volleys and charged, causing the French brigade to dissolve and retreat. Junot’s attack had failed, with the loss of all the guns that accompanied the two brigades and the wounding of two generals, Delaborde and Charlot. Beginning to understand that he misread the competence and determination of the British troops and seeing the British movement along the ridge, Junot despatched Solignac’s brigade with 6 guns to support Brenier in his attack on the British left flank. Junot renewed his main attack by sending his reserve of 4 grenadier battalions, commanded by St Clair and Kellerman, against Vimeiro. St Clair took the same route as Delaborde and Loisin, coming under fire from the British howitzers, using shrapnel for the first time in action. Heavy losses were inflicted on the French. St Clair’s grenadiers were in the process of deploying from column when they received volleys from three British infantry regiments. The leading French platoons were decimated and the column, like its predecessors, retreated in confusion to the bottom of the hill. Kellerman took his grenadiers around the northern side of Vimeiro Hill and directly attacked Vimeiro village. Fane sent the 43rd Regiment to attack Kellerman in the flank, while British guns on the ridge opened fire. The 43rd met Kellerman’s grenadiers in the entrance to Vimeiro village around the cemetery. Heavy fighting took place and the grenadiers were driven back. Junot’s second assault had been decisively beaten back, again with a heavy loss of men and guns. The retreating French grenadiers were charged by the British 20th Light Dragoons. After scattering the survivors from the French advance, the 20th continued their charge and were themselves attacked by French cavalry squadrons, being dispersed with heavy casualties, including the death of their commanding officer, Colonel Taylor. The action at the northern end of the ridge started as the fighting around Vimeiro ended. Brenier’s brigade marched too far to the north in the difficult country before turning west, and became ensnared in a deep ravine that lay along the front of the ridge on which the British left was positioned. Following Brenier, but without communication between the two commanders, Solignac made the correct turn to the west and came upon the British on the ridge. Solignac expected to be supporting Brenier, whereas he found his brigade to be spearheading the attack, with no sign of Brenier’s troops. The brigade of Solignac attacked the British left flank, but was driven back from the mountain by Ferguson’s and Nightingale’s brigades, which captured 6 French guns. The 71st Highlanders and 82nd Foot were left to guard the guns. These two regiments were surprised by Brenier, as he finally developed his assault on the ridge, and driven off the guns. Rallying, the two British regiments returned to the attack, recaptured the guns and inflicted heavy casualties on Brenier’s brigade. General Brenier was wounded and captured. Ferguson’s brigade was well on the way to capturing numbers of the defeated French troops, when the brigade commander received an order to halt. Brenier’s and Solignac’s brigades were being forced along the ridge away to the north, while Loisin, Delaborde, St Clair and Kellerman were driven due east, when all along the line the British pursuit was abandoned. The ‘stop’ order was given by Sir Harry Burrard, one of the officers senior to Wellesley, newly arrived from England, and, after landing from his ship, now in command. 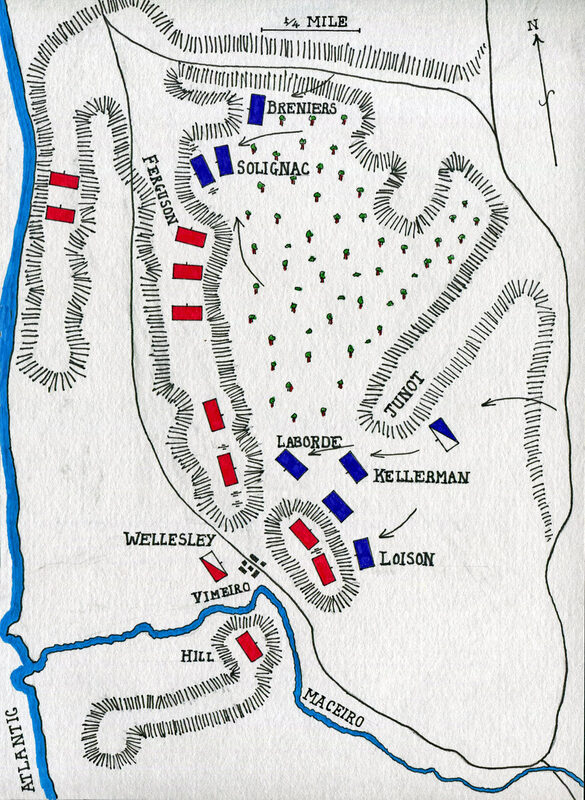 Sir Arthur Wellesley’s plan was to swing his unengaged right flank across his front, cutting off the retreat of the French Army by occupying the Lisbon road, while pressing the pursuit of the retreating French troops with his centre and left. Had Sir Arthur Wellesley been permitted to continue the British pursuit of the retreating French troops and the envelopment, Junot’s Army might well have been compelled to surrender entirely. 720 British troops were killed or wounded. Lieutenant Colonel Charles Taylor of the 20th Light Dragoons was killed. French casualties were around 2,000 killed, wounded or captured (several hundreds were made prisoner). 13 French guns were captured. After the Battle of Vimeiro, the French General Junot asked for a capitulation on the terms that he and his army be repatriated to France. The two officers who had superceded Wellesley, Dalrymple and Burrard, agreed to the terms and the French Army was transported by the British Fleet to France, together with the loot the French had taken while in Portugal. There was outrage in Britain and the three senior officers involved, Dalrymple, Burrard and Wellesley were subjected to an enquiry. Command of the British army in Spain passed to Sir John Moore. Sir Arthur Wellesley was exonerated by the enquiry and re-instated in command in Spain. In the meantime, Sir John Moore had conducted the retreat to Corunna and been killed. During the fighting on the hill, Sergeant Patrick of the 43rd Regiment and a French soldier were found dead, having bayoneted each other simultaneously through the body. 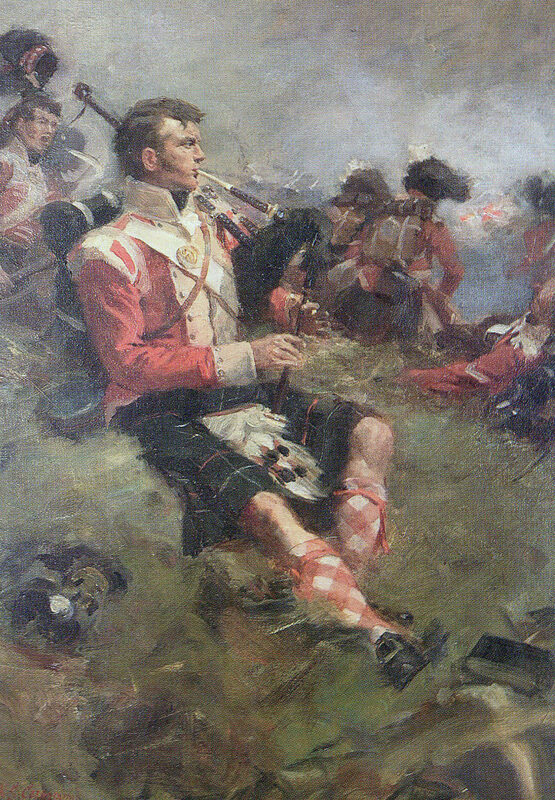 Piper George Clark of the 71st Highland Light Infantry was wounded during the Battle of Vimeiro, but continued playing his pipes sitting on a rock. Piper Clark was presented with a set of silver mounted pipes by the Highland Society of Edinburgh for his conduct at the Battle of Vimeiro. The friends of Lieutenant Colonel Charles Taylor, killed at the head of his regiment, the 20th Light Dragoons, at the Battle of Vimeiro, placed a memorial plaque in the cloisters at Christchurch College, Oxford, which states: CHARLES TAYLOR esq. M.A. formerly student of this House: Lieut: Colonel of his Majesty’s 20th Regiment of Light Dragoons. He had the merit of having formed and disciplined that regiment himself: and at the head of a small part of it, in the Battle of Vimeira, August 21st 1808. He attacked and defeated a very superior body of the enemy’s cavalry, who were advancing rapidly against the flanks of the 50th and 52nd Regiments of Foot. He fell in the moment of victory. His first and earliest friends, who know that they were dear to him, as he was dear to them, have placed this tablet to his memory.